If you've been waiting all Summer to take your business seriously again, it's TIME! Fall is upon us and I hope your calendar is filled with bookings. Now to make sure those bookings are paying off for you. 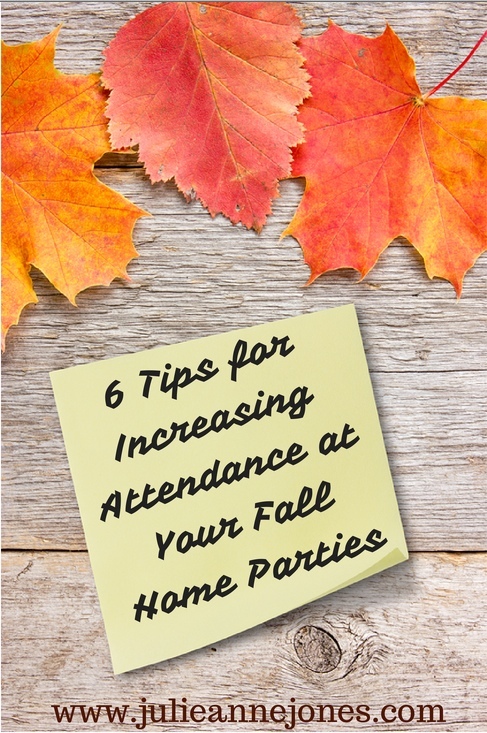 The thing is, a large part of your success from those Fall parties relies on the host having a living room full of guests. So the million dollar question is, how do you support your hosts to make that happen? Make sure your host chooses a theme. I always ask participants at my live events, "Would you rather attend a bread and water party or a Mexican Fiesta?" Get it? A theme says "Come party with me" not "come to my house and make sure you bring your checkbook." Get a guest list and postage from every host, NO MATTER WHAT! This not only assures that you'll a list so you can send out the invitations (it's pretty hard to attend a party if you don't have an invitation), but more importantly, it solidifies your host's connection to you and her commitment to the party. It's the task most people hate to do the most, so having her get it done first thing ("Eat that frog" anyone?) makes it more likely that she'll actually get it done. Plus (and this is the most important part), you'll have a virtual insurance policy against that party cancelling if you have the guest list and you mail the invitations. Create and send a fun, compelling invitation that features that theme. And no, your company's simple postcard invitations really don't count. Honestly, think of your reaction the last time you received a postcard invitation in the mail to another home party. How excited were you to attend? See what I mean? (You can download our "Margaritaville" themed invitation for free on our free tools page on the website here). Create a relationship with your host prior to her party. Host coaching is the key to success in your party plan business. Period. Your host will work hard at promoting your party and making it a success if she feels a connection with you and likes you. And a nice added perk to host coaching is that, if you're offering your opportunity to your host as part of that experience, you'll generally sponsor 1 out of every 8 or so hosts with whom you work. Give your host clear instructions. This is so important. I say all the time people won't open their mouths if they don't know what to say. And I've found that people generally do what they're told. So give your host a goal to make follow up calls at least two days prior to her party and do a little role playing that shares some enthusiastic language about how much fun the theme is going to be so she knows what to say. Some consultants even take on this task for their hosts. Just make sure it's getting done. Follow-up often. Believe it or not, your party isn't as big a priority for your host as it is for you. And you want them to understand that you're there to support them. So make a follow-up call about a week prior to the party, just to touch bases and share your excitement for her upcoming party. Then follow-up at least two days prior to the party to remind her to make follow-up calls, as well as the day before the party to make final plans. What about you? What are some of your ideas?